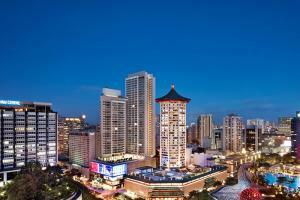 The iconic Singapore Marriott Tang Plaza sits at the very heart of Orchard Road, Singapore's shopping mecca. This award-winning hotel offers unparalleled accessibility to the city's many attractions. Upscale guest rooms and suites feature tasteful decor and plush amenities for your comfort and relaxation. Satisfy your cravings at one of the award-winning restaurants, where you’ll discover a diversity of gourmet options. Soak up the sun at the sparkling pool or pamper yourself with a therapeutic treatment at the luxury Serena Spa. Located approximately 14 miles from Singapore's Changi Airport. The Orchard MRT subway station is conveniently located at the hotel's doorstep.